Before watching First Blood, I envisioned the character of John Rambo (Sylvester Stallone) to be a shirtless, testosterone-fueled one man army armed with a machine gun and endless ammunition. This is the image that I had been fed through the pop culture canon over the years. I was a bit surprised, then, to find a mentally damaged Vietnam War veteran in place of the fearless commando I thought I knew. 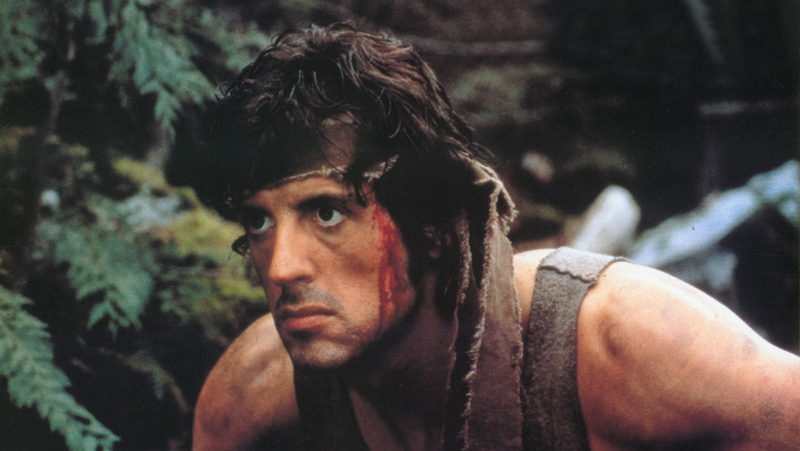 First Blood begins with a shaggy-looking Rambo wandering the streets of a small town in the Pacific Northwest. The local sheriff, Will Teasle (Brian Dennehy), notices him walking about and forcefully “offers” a ride out of his town. After being dropped off, Rambo simply starts walking back the way he came, drawing the ire of the sheriff. Teasle arrests him for vagrancy and drives him back for a night in jail. Once there, the rest of the police force joins in on giving Rambo a hard time for no good reason. A few officers attempt to give him some unwanted grooming; when a razor is pulled out, Rambo has a flashback to being tortured in ‘Nam, and he panics. He fights his way through the entire building, steals a dirtbike and heads deep into the mountains, now a wanted fugitive. The police force, equal parts stubborn and embarrassed, refuse to back down, and soon tracking dogs, the State Patrol and the National Guard are all brought in. Little do they know that Rambo is a former member of an elite Special Forces unit, and the odds are actually against *them* to survive. Rambo’s mentor, Colonel Sam Trautman (Richard Crenna), arrives in an attempt to talk sense into both sides, but by then it’s all too late — this is war. The idea of Rambo taking on an entire town’s worth of enemies is a bit ridiculous, but it never feels as outlandish as other 80s action flicks. Stallone does a tremendous job of getting us to be on his side, even as he lays waste to a poor, innocent town. He even gets to show off his acting chops in a surprisingly touching final act. The closing scene with his Colonel is what really pulls everything together, and it provides some sort of meaning to what had until that point been a relatively run-of-the-mill action film. Good review. It has been a very long time since I’ve seen this … But for what I remember, I agree. I love this movie to this very day. Such a great action flick and one I find, that I can throw on any old time to enjoy. Glad to hear you’re a big fan. I could see myself getting sucked back into it if I were to come across it on TV. I had such a blast watching this in the theaters upon it’s initial release and so many times after that with my Grandpa. Great review! Thanks man. This does seem like a film that would hold up on repeat viewings. Great review, as always. I’ve actually never seen the entire film, only bits and pieces over the years. You’ve got me wanting to sit down and actually watch the movie now. Not really a Stallone fan (something about him annoys the hell of out me), but I’ll give it a shot. Thanks! I think this one is worth watching all the way through. Not sure if you’ve seen the ending, but it really does a great job of putting things in perspective. Always enjoy the scene where Rambo gets the drop on former ‘Hill street Blues’, derby wearing punk. And future Miami CSI. David Caruso. Also one of Richard Crenna’s last beat roles. Thanks, Jack. I got a huge kick out of seeing a young Caruso in this. He fit in so well with that awful police force. Yeah, the first film is more of a character study than the later entrys in the Rambo series. I remember First Blood entertained me, and even made me think, which is rare for a S Stallone movie. Been a while since I last saw this one, though. Yeah, I was really surprised by the ending and how it took a pretty strong anti-war stance. Until that point, I wasn’t all that impressed with the film. I saw this ages ago and I could see its appeal despite Sly’s incomprehensible lines, ahah. I haven’t been interested in seeing the sequels though. 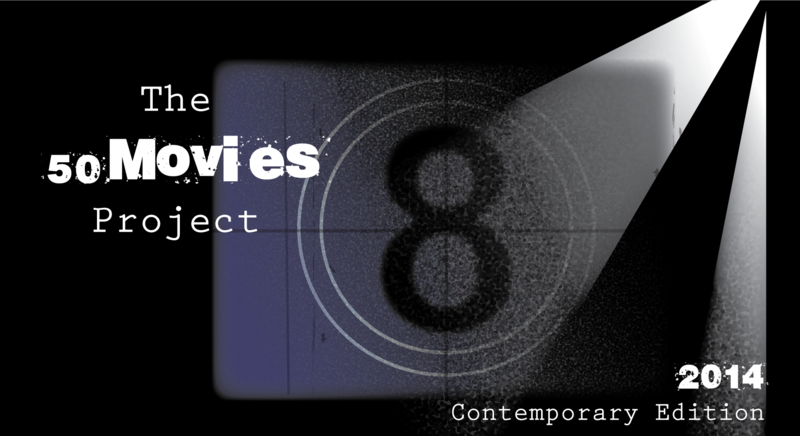 I’m kind of curious to see the sequels, but it sounds like they aren’t quite as thought-provoking as this one. Could be mindless fun, I suppose. Hey, great review! I fully agree with your re-cap and overall rating! This was a childhood favorite of mine. Surprising to see what a “grounded” movie this was (although of course Rambo was still a sumerhuman badass to some extent) in comparison to the ridiculous one man doomsday machine he becomes in all of the sequels. I remember in the commentary from the DVD I watched that they actually considerably toned down the body count from the book the movie was based on [SPOILER FOR THOSE WHO WANT TO READ THE BOOK} (in the book Rambo takes out like half the police force, and is killed at the end… Good stuff man. 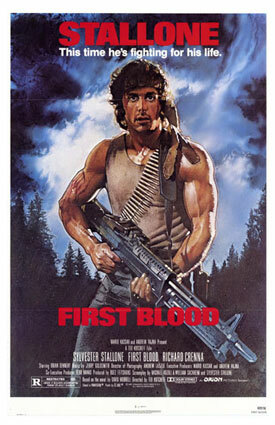 I think it’s really interesting that they never intended for First Blood to have sequels. Apparently they even filmed a suicide scene at the end. Wonder if that’s on any of the DVD releases…?